El Molino del Conde is a beautiful white Andalucian mill set in large grounds bordered by the Arroyo de los Cerezos stream. Excellent access to the vibrant Spanish cities of Granada, Seville, Cordoba, Ronda and Malaga. 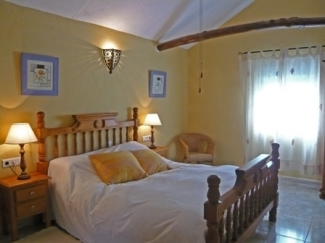 Rent El Molino del Conde as a large country villa (10 bedrooms and 7 bathrooms) - perfect if you're a group of friends or an extended family - or choose to rent part of the villa (5/6 bedrooms, 4 bathrooms). Catering and maid service can be arranged. 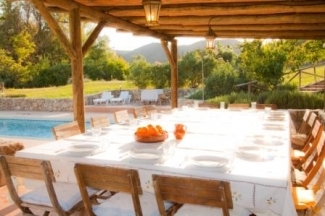 Set in the tranquil hills and olive groves of rural Andalucia near the lovely lake Iznajar, El Molino del Conde is a large country villa where all generations can enjoy family holidays or celebrate special birthdays and anniversaries in the sun. El Molino del Conde also provides a peaceful and inspiring venue for courses - which have recently included Creative Writing, Watercolour Painting and Pilates. 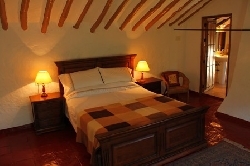 El Molino del Conde has been lovingly restored to retain all the character of the old mill house and ensure a high level of comfort. There are high beamed ceilings, well equipped kitchens, comfortable bedrooms and large luxurious bathrooms. 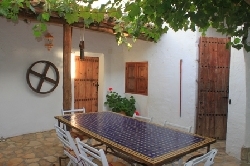 Outside, you'll find fresh eggs from the chickens, fresh herbs from the kitchen garden, pomegranate, fig, almond and walnut trees, sun terraces, swimming pool, large shaded dining areas, picnic spots next to the stream, a vine-covered courtyard and large grounds where children can run around safely. El Molino del Conde has a multi-sports court in the gardens - a 3/4 size tennis court also suitable for badminton and volleyball - and an indoor heated studio suitable for yoga, Pilates, art classes and indoor cinema. "I just wanted to say thank you to all of you for a brilliant holiday. I am speaking for our entire group when I say we had a truly wonderful time. As you know the age range of the group was from 48 down to 3 and El Molino and the surrounding area catered for all of us. Thank you once again for a really special holiday that none of us will forget.�"
"Thank you so much for letting us stay in your beautiful villa, we all had a great time! It's great to escape London to somewhere so peaceful." "Already wishing we were back in sunny Spain. 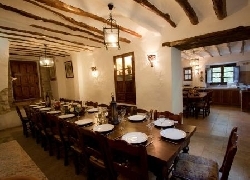 We really enjoyed your fabulous corner of Andalucia and found the amenities and level of comfort at El Molino excellent. The outside living was perfect for the weather and that lovely big kitchen was great for the vast amount s of food we always seemed to be preparing." "Really, really enjoyed our stay at El Molino .... you have a great set up, well done .... a fantastic holiday was the verdict of everyone, and in terms of a group location it worked really, really well. Thank You!" "Thank you on behalf of all of us for an absolutely brilliant weekend. El Molino is a beautiful house in a magical setting and we loved every second of it"
"Thank you. It was perfect"
Partial hire also available (5/6 bedrooms) please contact us for details. Outside of school holidays, discounts are available for families travelling with young children.